Fencing Time, LLC is proud to announce the public release of Fencing Time v4.4! Fencing Time v4.4 adds many new and improved features for tournament organizers worldwide. Fencing Time v4.4 also marks the official debut of our new live results website, www.FencingTimeLive.com. This is a huge step forward in live results publication - not only does Fencing Time Live provide visitors with a superior browsing experience on both mobile devices and desktop computers, but it greatly simplifies the process of publishing live results. No longer will you need to figure out where to host your live results nor need to get the detailed login information needed for your site. Now, you simply enter an access code and your live results will automatically appear on www.FencingTimeLive.com! Other major new features will especially help organizers of regional events in the USA. One major new feature is the ability to re-import the registration file downloaded from the USFA website - this will update your tournament with the latest registration data (added and scratched fencers) as well as the updated referee list. For organizers that are using the Fencing Time Server version, we are pleased to announce the availability of the Fencing Time check-in kiosk app. This is the app you see at national events for check-in - you can now use it for your events! Organizers outside of the USA will also benefit from new features, especially those running FIE and EFC events. A number of improvements have been made, especially in the area of referee draws. Many of these new features were successfully used at the 2018 World Championships in Wuxi, China. For the complete list of improvements, see the version history page. Fencing Time v4.4 is a FREE upgrade for customers who have a Fencing Time version 4.x license. You do not need to purchase a new license! 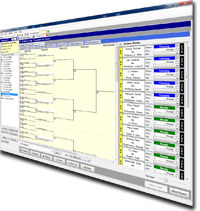 Fencing Time is the most sophisticated, yet easy-to-use, software available for managing fencing tournaments of any size. Whether you are running a 10-person event, a World Cup, or a 10,000-person national championship, Fencing Time will make the job easy and allow you to provide the best experience for your competitors, coaches, and spectators. Fencing Time has been used by USA Fencing since January of 2012 to run every national-level event. These tournaments are among the largest ever run and Fencing Time has handled these huge events with no problems. Fencing Time is fully homologated by the FIE and its use around the world keeps growing. In 2018, it ran the World Championships in Wuxi, China with great success. Every season, it continues to be chosen to run more and more World Cups and Grand Prix. It is quickly being adopted as the standard software for running events by a growing list of fencing federations around the world. Fencing Time is available in two versions: Standard and Server. Read on to learn more about what each version offers and check out the feature comparison chart to determine which version is best for you! The Fencing Time Server stores your tournament data in a centralized database, which allows you to use any number of computers to manage the tournament simultaneously. You can add additional computers to handle your check-in desk and eliminate paper sign-in sheets completely! Plus, with the Fencing Time server, you can set up an unlimited number of remote monitors at your venue, each displaying customizable tournament information. If you've attended a USFA National Event, you have seen the Fencing Time server version in action - and now you can have the same technology for your events! If you don't need the multiple-computer capabilities of the Fencing Time server version, the Standard version includes all of the new features and improvements, and can be run on a single computer just like prior versions of Fencing Time. Fencing Time is FIE homologated and has the ability to customize its operation and rules to a specific fencing federation. And, if you prefer, you can run Fencing Time in English (US or UK), French, Spanish, Polish or Chinese! Fencing Time v4.0 HS is a custom version of Fencing Time designed primarily to serve the needs of high school fencing in the state of New Jersey. For more information on this version, see HERE. Fencing Time has far too many new features to list here! Take a look at the Feature Comparison for highlights, or the Version History for a complete list of new features.